The Mysterious "Masked SIMM" Revealed! Derive MCA Bus from ESDI Ports? Modify 160MB SCSI HD with ESDI PCB? 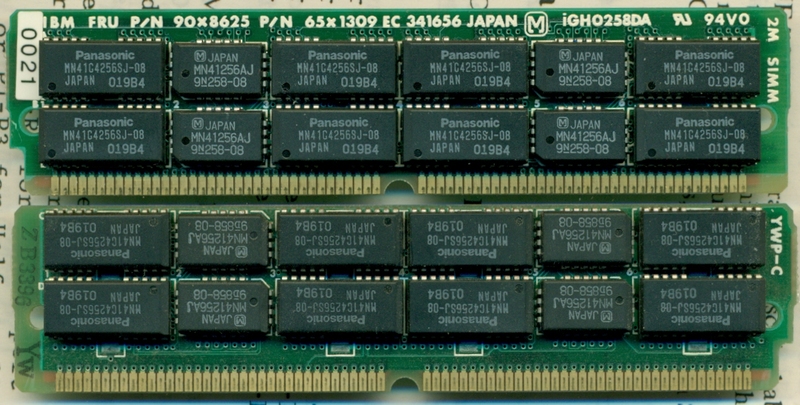 The P70 came in two planar versions: the older 38F4688/65X1564, used primarily in the 20 MHz -061 machines (but also seen in some -121 20 MHz boxes), and the 38F6973/56F9085 used in 16 MHz and 20 MHz -121 models. 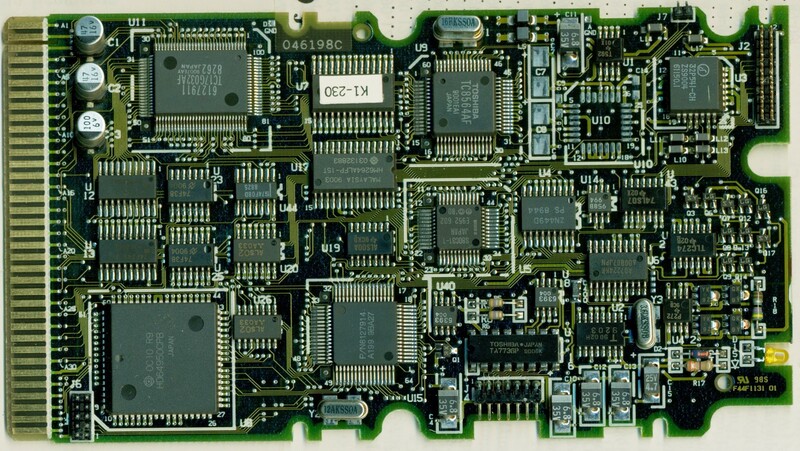 38F4688/65X1564 planars have the 386DX socket immediately to the right of the 387DX socket, and two BIOS ROMs near the upper left edge of the board. The 38F6973/56F9085 has the 386DX socket above and to the left of the 387DX socket. Another distinguishing feature of the newer models is the inclusion of video output filtering on the video card instead of on a 'daughter card' fitted in series with the video output cable. The newer planar seems slightly faster on some benchmarks, but the difference is hardly noteworthy. While desperately searching for a working drive, research turned up some assertions that the 2.88MB 64F4148 worked (Sony MP-F40W-00). The floppy header is on the correct side, the only downside is that the floppy eject button is about 1/8" too long to shut when a floppy is in the drive. Not a bad trade-off. End result is a choice for 2.88MB Diskette. Note that running autoconfiguration sets it to 1.44MB, but hey, it still works! Just like their big brother, the P70 prefers the Panasonic SIMM in SIMM2. 85nS speed. Thanks to Tim N Clarke for digging through his private stash. Notice the places for R1 and R2, yet there is no solder dots on the reverse for R3 and R4. Yet the multimeter shows OXOX (pins 67-68-69-70). From this, "masked" probably means the SIMM's PCB connects pin 68 internally, i.e. in the mask for the traces. This is an original Panasonic iGH0258DA. Not even markings for PD resistors. Yet the multimeter shows OXOX (pins 67-68-69-70). PD bit shunts are definitely part of the SIMM's PCB mask. Note: the four white outlines under the big memory chips are SMD capacitors. If you look edge-wise at the SIMM against the light, you will see SMD caps under the big chips on BOTH sides.. The P75 will digest Kingston KTM-2000/M70 memory, but the late P70 planar wants nothing to do with it. When I was trying to snap a KTM-2000/M70 into the socket, it looked "bowed", it may be the center notch is not deep enough? I kept getting not properly seated as a possible cause. But whether it was all KTM-2000/M70, or M70/IBM, it threw a 225. I cannot recall right from out of my head if the P70 reads all 4 bits of the PD signal or if it masks it down to the two important bits only. In this case certain 4MB modules might be detected as 2MB ... but end up in an error later during memory count. F1 KB fuse "SOC 1A"
Thanks to Jay P. Thorne who went through the tedious process of pulling his P70 apart for the scans I used for the New System Board and New System Video Card. Odd, the 8259As have been integrated into one of the Gate Arrays. The 8042 has also been integrated, but there is a 8042 PLCC outline to the right of the PS/2 mouse port. PRT has also disappeared. By the way..: I have the new type of display card and plasma panel. Since the old display card will not work with new plasma panel (or vice versa), I guess that the old panel connections are different. The panel is a Matsushita electric type MD480T640PG4, P/N 38F4744. made in week 06,1990. The machine is originally a model 8573-031 (16Mhz processor, 30MB disk), but someone has put in a 60Mb disk. >I will be surprised if it can be disabled. Just remove the harddisk .... the ESDI controller is underside :-) These drives are drive and controller in one physical unit. The strange 2-connector port they are attached on the P70 is in fact a "sort of" MCA connector. The card-ID is DF9F and it will show up at slot 3 in the setup. MCA Bus from ESDI Port? > Can you hack an MCA bus out of the pseudo-one in the ESDI-DBA connector? I'm told that this is not possible because the connector carries only those signals needed for the disk, and not enough for a general MCA card. The VGA port supports all VGA graphics and text modes including 640 x 480 graphics, 320 x 200 graphics in 256 colors, and 720 x 400 text using any optional PS/2 VGA color display, and maintains compatibility with CGA and EGA modes. Unlike to the P75 the P70 cannot drive Plasma and external VGA at one time - except in DIAGS mode. As I said in a previous posting: the VGA chipset on the plasma-video adapter is the same 256K-IBM / INMOS stuff as used in the Mod. 50 / 60 / 70 / 80 - and therefore has the same limits: 640 x 480 at 16 colours ... ending of sending. So the answer is "No - you cannot get more colours at 640x480". I'd really tried a lot to get more out of that thing (back in the good old days) but it simply doesn't work. The available memory on the bit-planes is too low. You need at least 512K VRAM (and a better Video DAC) but the Inmos-DAC *should* be able to get it - probably. It is specified for a video bandwidth of 18.44 Mhz only (which is 640 x 480 with 60 Hz vertical refresh) - but the main problem is the missing Video-BIOS mode for 256 colours at 640 x 480 and the missing V-RAM. Simple calculation: 640 x 480 pixels = 307.200 pixels total. Each one occupies 4 bit for 16 colours = 153.600 bytes V-RAM (Video Mode 12h). The 320 x 200 / 256-colour mode (Mode 13h) occupies 8 bit per pixel and therefore a 256-colors mode would need double the space. The Video-DAC controls 4 x 64K for each "Map", where the maps are the bit-planes for red, green, blue and intensity on the 640 x 480 mode. The Video-DAC adress buffer resides at A000h - AFFFh (whereas the locations from A95FF - AFFF are "reserved"). >is possible to use the display card of a P/2 Model P70 in another PS/2 system with onboard VGA. I don't want to use both screens in the same time. I do not want to use any CRT. I want to use the plasma screen on my PS/2 Model 55. As far as I can tell - you can't. The plasma board is basically a plain vanilla VGA card with a different output stage for the row/column addressing of a plasma display. But internally it uses the same chips, addresses and ports like the generic onboard VGA of the 55SX - apart from the odd form-factor of this card. The card-ID should be EDAF - but there is no ADF for this card. There is an @EDAF.DGS on the P70 reference and that means the ADF function is substituted by the board logic setup internally, so you cannot take it over anyway. The P70 / P75 have built-in information on this EDAF card and need no ADF then - the 55SX (and none of the "normal" PS/2 machines) hasn't. In addition you need the P70 power supply for the high voltages to run the plasma display. The following figure shows the Signal assignment of the plasma display adapter connector. 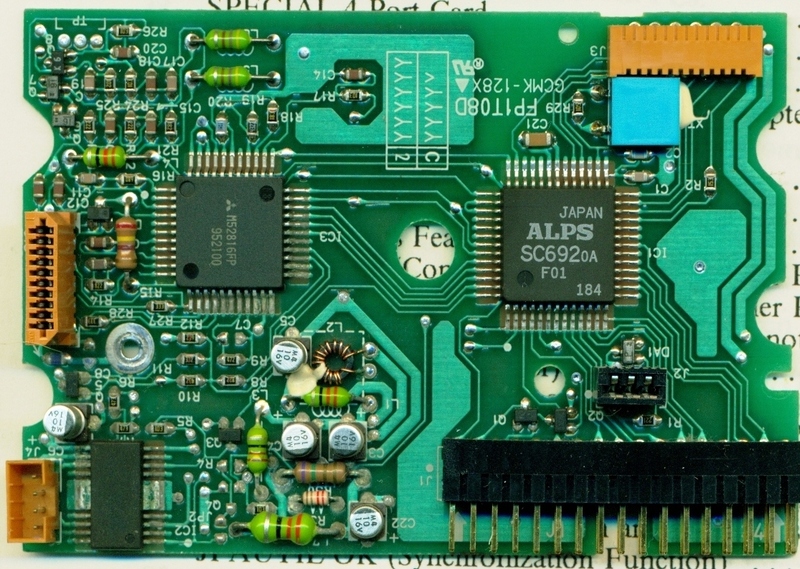 The connector contains the same signal set as of the 16-bit micro channel connector except two pins; the pin B04 does not provide the signal 14.3MHz OSC and the pin B45 is assigned with the signal -KEYSTROKE for the plasma display. The plasma display has an auto-dim function. It automatically turns the plasma display off after the specified period since the last keystroke. Any keystroke returns the plasma display on. A desired value for the period can be specified approximately in the range 1 to 120 minutes during the system configuration by the backup copy of the reference diskette. Note: For German models, the background intensity of the screen is selectable. The background intensity does not affect the auto-dim function. 1. During the system configuration, plasma display may be enabled (PDP ENABLE bit is set) and a value corresponding to the specified period is stored. 2. When the auto-dim function is enabled. the AUTO-DIM ENABLE bit is set by POST (Power-on Self Test). 3. The up-counter increases each minute with a interval pulse derived from the VSYNC (Vertical Synchronization) signal. 4. The comparator compares the count and the value specified for the period, then the result is latched. 5. The result is gated twice into the plasma display. If the AUTO-DIM ENABLE bit is set and the count has reached the matching value, the plasma display is disabled and the up-counter is reset. Otherwise, nothing is performed. 6. Go to step 3. I used a scope on the connections, and I was able to identify pins for 4 databits, pixel clock, vertical and horizontal sync. There are still 2 or 3 unknown signal pins, one is probably a blanking or data enable pin. 1 Vertical sync, active high. 15ms period, 62uS high pulse. 3 Horizontal sync, active low. 32 uS period, 3,8uS low pulse. 13 Data Enable? Blanking? One long 8mS high pulse, then many 32uS period pulses, with high time = 6.3uS. - then pattern repeats. 17 Display On/Off . Low signal = on. Goes high after 10 min display blanking timeout. Maybe the 1.1 mS periods is longer when the display is blanked at the top/bottom in CGA/EGA mode? I will look into this when I get software that enables CGA/EGA mode. 21 Unknown signal. No visible activity. All even-numbered pins are GND. 1 Pin 16 on 74LS241 via 330 ohm. - this corresponds well with a clock signal. 21 Unknown. No visible activity. The connector corresponds CN1 on the drawing on your page. The machine is located elsewhere at the moment (at work), so the drawing is from memory. I will correct it if I'm wrong. | o o Three-pin capacitor?? | \________Pin 2 of display panel cable. Remove Floppy (H1) I have two -121s, one has the H1, the other has an H2. Open the plasma screen so you can get your hand behind it.Grasp the lower edge of the drive cover, pull out and forward. Once it snaps off (you will feel it, pull the cover up and out. If you grab onto the floppy slot, it should give you enough of a grip to do it. Unscrew the black screw at the bottom center of the drive carrier. If you look between the floppy cable and the grounding strap, you will see it. Thank God it's a captive screw. It's a combo standard/phillips screw. With the retaining screw loose, push the drive carrier up until it comes free of the case clips. Now you have full access to the floppy drive mounting screws.You must remove the floppy from the carrier before you can take the floppy cable out. Reverse action of removal. Hook on case clips and pull down. When seated, screw in the black retaining screw in the bottom center. Now look at the sides of the drive carrier. Notice the slots about half way up the carrier- they go straight in, then go down. Look at the cover- it has two posts... slide the cover onto the carrier, make sure the eject button is lined up with the hole. Now push the cover down until it snaps into place. Congratulations, break out the Jolt! 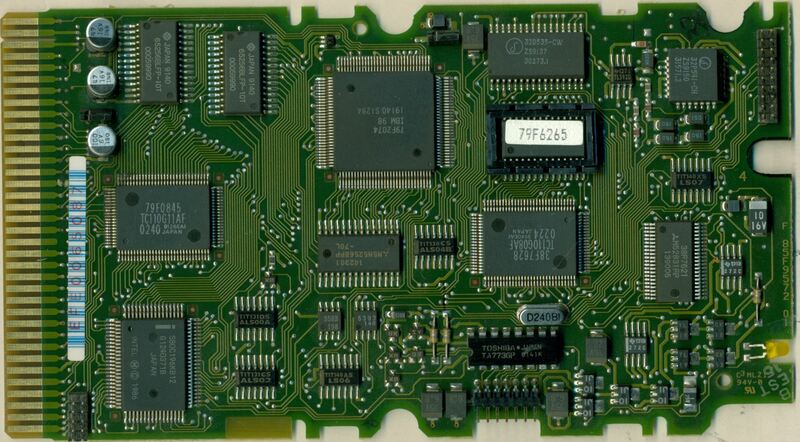 The image is of the rear or bottom PCB from an ALPS DFP723D15C floppy drive, P/N 38F7802 FRU 38F5936. It is correctly oriented in the position it would be when installed, e.g. with the 34 pin header pointed down. Not a fun day. Many of the solder joints in the lower left have a "grainy" look to them. Oddly enough, the power component in the lower left corner by J4 (floppy motor power) has green corrosion on BOTH sides. One would think if it was from a leaking cap, it would be toward the source of contamination. At this point, I am hesitant to start recapping, due to the poor looking solder joints of a whole bunch of teeny tiny components. Heck, some SMD components have the grainy solder appearance looking almost as big as the component... Maybe a good application of baking soda and water could remove some of this, but I am not confident. This shows how to remove the carrier and battery. To replace just the battery, pull the catch away from the battery, and pull the battery up. Battery is FRU 72X8498, and the common replacements are HERE Usually in the camera section of your local supermarket. The rear port is designed 'pointing device port' in users manual as well as HMM. No keyboard will work on this port ! Don't use a serial mouse to PS/2 port adapter! You may just end up frying something! 305 error at power up ? That is a sure indication that the keyboard/mouse port fuse is blown. If you open the unit and look at the lower side of the board down from the rear mouse port you will find a little black square fuse. "SOC 1A" printed in white on it. Maybe you need to bend the EMC (grounding) shield a bit up to see it. It is marked F1 on the planar and surrounded with a box printed in white. (Left of the board fixing screw). Check continuity with a multimeter. If it reads infinite resistance it is blown. To change it: no need to remove the entire board (and too complicated anyways). Just cut the fuse with a sharp pliers directly at the fuses' case and remove it. Bend the remaining contacts up and straighten them a bit. Get a new microfuse (resistor style fuses) and solder it to these contacts. Cut off the rest of the "legs" and that was it. If you end up in a non-functional keyboard and no blown fuse ... well ... you'd damaged the keyboard / mouse controller, which cannot be replaced (that easy). In this case you should try getting a replacement system board. All dimensions are from the rear of the drive. They are to the center of the hole. Be careful when drilling! These placements DO NOT line up with the reinforced segments of the drive case. Be careful when tapping! Use a plug tap, a normal tap would bottom out on the PCB. The mounting holes do NOT line up with ANY holes on modern drives, even the 0661 drive holes WILL NOT FIT. The drive will mount upside down, there is no other way to do it. o Integrated 16-grayscale plasma display, integrated version of IBM Enhanced PC Keyboard. * Some half-length cards that fit in a half-length slot may not fit in a full-length slot. > the Auto 16/4 Token Ring fits into the bottom 16 bit slot, almost like it was built for it. The short 4Mbit on which the later 16/4 short design is based on *was* in fact particularly designed for the P70 ... some time back in the late 80s when the P70 (and the P75) appeared in IBMs list there was a "short Token Ring card" offered along with it, while the "normal PS/2" still got the "toilet-seat 4 Mbit TR card". The Token-Ring Network Model P70 386 Adapter/A (#1598) permits attachment of the Model P70 386 (8573-061 and 8573-121) to the IBM Token-Ring Network. This adapter is half-length and designed to fit in the short slot. It transmits and receives at four million bits per second. To facilitate attachment to the IBM Personal System/2 P70 386, a unique L angle connector with a permanently attached short cable is provided. 113 Error is a DMA timeout caused by a MCA card ... if there is nothing installed except the harddisk - replace that. It doesn't look like one, but the 72-pin card-edge connector is in fact a MCA connector (Slot 4 in the setup). > As noted in a different thread: some series of 120 and 160MB HDs did not run properly when installed "upside down" in the P70. Either they come up with a 10482 error right after start -or- fail to LLFormat / run at all later but operate fine otherwise when turned "upside up" again. (WD-3158, WD-3160). >> The -031 models used the infamous "energy conserving" harddisk, which reduced spindle speed when in idle and spins up again when accessed. A nerve killer ! > Like the Mod. 50Z and 70 the P70 had fairly lot of problems with defunctional HDs. In the P70 *only* the black IBM WD-series drives had been used for the 60 and 120MB models - like the WD-3158 120MB drive from the Mod. 70-121 / -A21. The following figure shows the signal assignment and pin numbering for the fixed disk drive connector on the adapter. The fixed disk drive connector is a 2- by 36-pin connector. Side A of the connector is the top and Side B is the bottom. Modifying a 160 MB SCSI Disk was only half way successful (took of the SCSI PCB and hooked up the ESDI PCB from my bad 120 MB Drive). I can see the HD when booting with the Refdisk, but I get all kinds of errors when trying to format it. The 160 operates with a different number of sectors IIRC. Only have the data for the 80 and 160MB: 984 cylinders, 10 heads, 17 (80) and 34 (160) sectors. So the 120 must have 26 sectors (25.5 arithmetically - but there are no half cylinders ...). I think the 120MB controller cannot "fetch" a valid sector start ... and therefore jumps out. The LLFORMAT routine does not go *that* deep that it can write raw sectors on the media. That's usually the purpose of some factory tools. 160MB DBA-ESDI PCB 79F6370 NO COMPONENT IDs! Early P70s Fail to Retain Configuration after Quick "On-Off-On"
>> DASDDRVR.SYS under DOS. Early P70 (16MHz version) tend to "spit out" the configuration when you quickly power them off and back on. >Not only the 16 MHz ones. I had this phenomenon on my 20 MHz Rev.1 (which is up and running again) also. Seems a common phenomenon for the first PS/2 - which lacked a delay in the power supply. But the early 16MHz and all Mod. 60 were pretty critical. If you didn't wait at least 20 seconds after a power down you could have wrecked the config already.